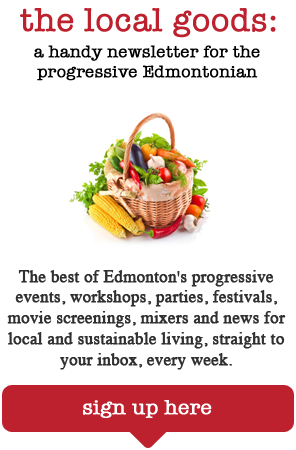 Editor’s note, June 2015: This is the 2014 version of #31daysofYEG. While we encourage you to try any and all of the challenges on this particular list, a new list of challenges for summer 2015 will be posted July 1, 2015, with weekly emailed updates (you can join our newsletter list here). Edmonton has lots of hidden gems to offer, if you just know where to look. The Local Good is challenging you to take some time this summer to go out of your way to engage in the city in new and different ways, by participating in our #31DaysofYeg challenge. Whether you do one per day or 31 all in one day, or in numerical order or randomly, we want you to experience your city with a new perspective this summer. The prize? Bragging rights, and great new ideas the next time you need a new date night spot, a family outing or just a cool hangout. Share your experiences with us and with others by tweeting photos with #31DaysofYeg, or by posting to our Facebook page. Click the link below to subscribe to the email list for the #31DaysofYeg challenge. You can also choose to be added to the general email list that provides information about Green Drinks, general Local Good news and blog updates. We’ll send you a #31DaysofYeg reminder each week, and, since we hope to make it an annual event, you’ll be the first to hear about all the exciting tweaks in the following years. You can, of course, unsubscribe from one or both lists whenever you like. 1. Take photo of something local you love. 2. Go to a local business you’ve always meant to go to but haven’t. 3. Tweet about a hidden gem in Edmonton. 6. Take a selfie with a local business owner/worker and mention an amazing fact about their story — or explain why they love being a local biz in yeg. 7. Look at our events calendar and pick an event to go to (and tweet about it when you go). 8. Donate $5 to a local cause or Edmonton-based Kickstarter and tweet about it. 9. Go to the farmers’ market and meet three new vendors and tweet a picture of their product. Spend two minutes getting to know them and learning their name. 11. Meet a stranger today — say hi to someone you don’t know and learn about them. 12. Buy tickets to go see a live theatre show and tweet a 140-character review. 13. Plan to go see a local band or musician and tweet from the show. 14. Give props to your city councillor. Learn about something they’ve done that you liked or didn’t and give feedback. 15. Read a book by a local author — there are plenty of local bookstores who support local writers, or check a local book out of the library, then tweet a quote from it. 16. Watch a music video from a local musician. Tweet which one you watched. 17. Take a picture of a native plant and see if you can stump local plant expert Robert Rogers. 18. Learn about Aboriginal history and tweet a fact that you learned that surprised you. 19. Ride the streetcar, and perhaps even check out a streetcar show! 21. Take a free “red hat” walking tour of downtown Edmonton. 23. Go on a bike tour of splash parks. 24. Get the city walking map of your neighbourhood (available at libraries) and complete a route on it. 25. Get the city walking map of a neighbourhood you don’t know well and complete a route on it. 26. Visit a city pool — outdoor or indoor. 27. Wade in the Legislature or City Hall Fountains. 28. Enjoy a beer from Alley Kat, Hog’s Head, Yellowhead Brewery, or Ribstone Creek at a local bar. 29. Find and read a historic building plaque in an older area. 30. Find your nearest playground. Relive your childhood by having a good old swing. 31. Check out madeurban.com for a birthday, wedding, or anniversary gift.